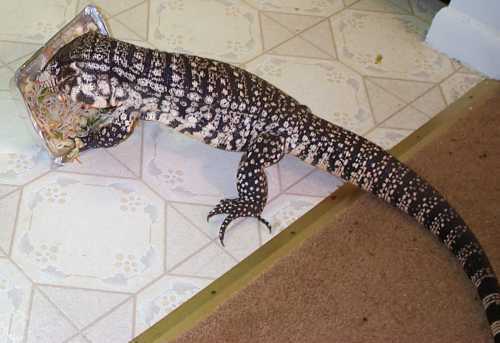 I currently own two tegus. 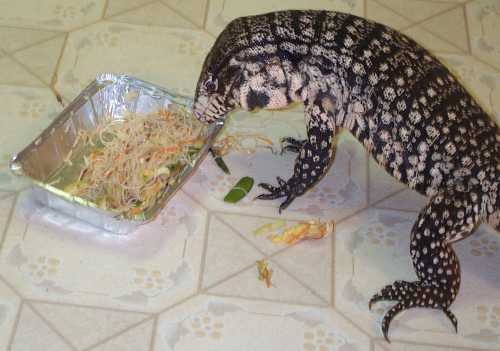 One is an argentine black and white tegu (tupinambis merianae) named Niels which I purchased from Agama International, a captive reptile breeder located in Alabama. 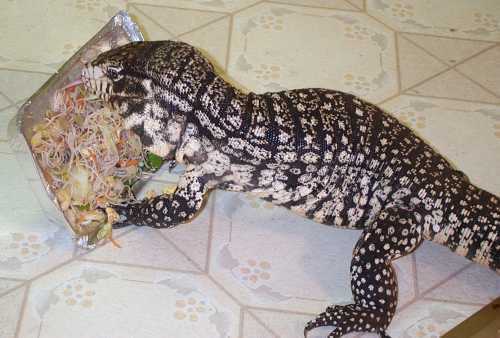 The other is a columbian black and white tegu (tupinambis teguixin) named Peaches which my girlfriend gave to me for my 22nd birthday. 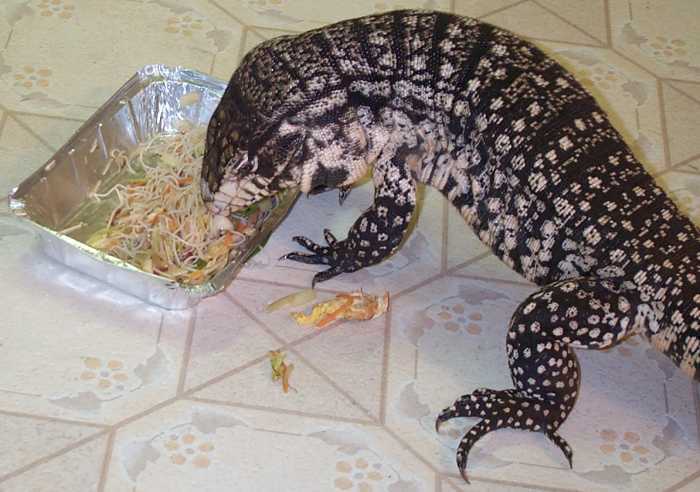 I am including the discussion of the enclosure here because both tegus live in the enclosure and prettymuch everything that I have to say about it is the same for both animals. I constructed the enclosure in which Peaches and Niels live, which is 8' long by 2.5' deep by 2' high. It had been 1.5' high but I found that too restrictive and limiting, so I retrofitted it with taller walls. 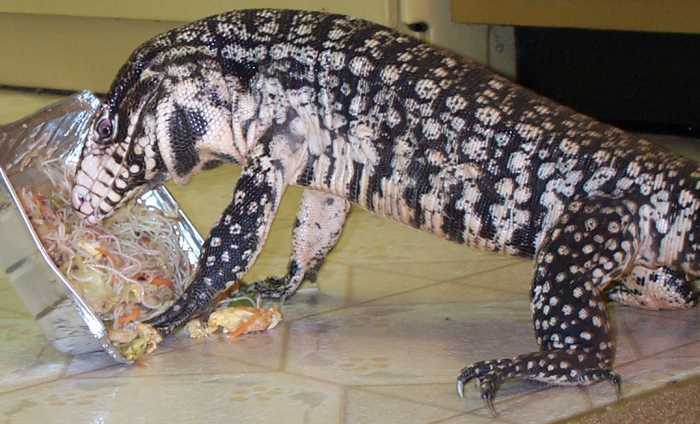 I've learned some interesting things about building tegu enclosures, which I'll try to relate here. 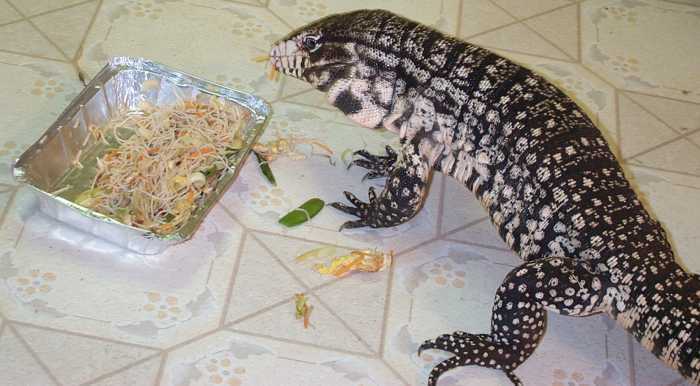 Plexiglass is great stuff -- strong enough to withstand a hungry tegu ramming into it when running at the approaching food dish, flexible enough not to hurt said tegu whenhe hits it, very optically clear, and a better insulator than glass. Unfortunately, however, the flexibility of plexiglass has a downside: plexiglass is very flexible stuff and this means that one needs to put a lot of latches on it to keep tegus from pushing it far enough to create a place to escape. The inside of a properly humid tegu enclosure is very humid indeed - thus all exposed metal on the inside (screws, angle-brackets, braces; and probably metal on the outside, as well) should be something that won't rust. I've had good luck with brass (and brass plated) stuff. While both are great for many purposes, neither silicone nor superglue are very good at making brass stick to plexiglass. I found silicone to be prettymuch useless (while the latches did stick, they came off when any signficant force was applied to them). Superglue (ethane cyanoacrylate) is a bit better, and some of the latches that I used it to attach are still holding. However, some of them have also come off. I've currently switched to attaching them with epoxy. So far it seems good, by we'll see how it holds up with time. As attractive as various types of reptile carpets are, some sort of diggable substrate is both much easier to take care of and makes the tegu much happier. Right now I use a combination of T-Rex Forest Bed and T-Rex Coconut Bark (primarily the forest bed with a few packages of the coconut bark on top). I keep it about 2-3" thick (Niels and Peaches rearrange it as they see fit). I find that it is much easier to clean droppings (with a carpet, particles get worked into the carpet and are difficult to remove -- with a particulate substrate, you just remove the affected area, which is very small and thus only requires adding additional substrate probably once, maybe twice a year -- the cost is negligible compared to the spared effort and better appearance), it satisfies their natural desire to dig (they just rip up carpet), it's much safer on their claws (they each lost a claw when kept on the carpet), and really helps to keep the humidity up. Actually, I want to reemphasize the appearance part. One aspect of keeping reptiles is the pleasure in looking at beautiful animals. That is lessened greatly by a dirty carpet. When the substrate is particulate matter, it looks both more natural and when you clean you are essentially guaranteed that it won't take much effort for things to look as they should. Carpets are just difficult to clean. The humidity aspect is perhaps the most important, though. As long as the bottom layer of the substrate is wet (I just water the entire thing with a watering can every few days to a week), when the burrow into it to sleep at night, their skin gets hydrated very well. Actually, Niels sleeps under a plastic upturned dog litter box, and it's a lot of fun to watch him move the substrate to plug up the hole when he goes into it to sleep in the evening. All of those stories of lizards rubbing against rocks to help get rid of shedding skin are quite true -- it's important to have some sort of rough rock that's either heavy or bolted (or glued) down so that they can get pieces of their shed to come off. I currently use a 3' fluorescent UV reptile bulb. I somewhat regret having gone for the 3' model rather than the 4' model. There isn't much of an energy savings, and 4' is much more standard. If I had it to do over again, I would install a 4' ballast. Whether I'd use one or two bulbs, I'm not really sure. I currently use only a T-Rex Cobra heating pad (size: 60+ gallon terrarium). Since the enclosure is, while not airtight (that would be very bad), pretty contained, the pad keeps the enclosure between the high 70s and the low 80s. Moreover, the lizards frequently lay on it to fulfill their basking needs. I have used this setup for nearly a year now and it seems to be working well with healthy, active lizards. Moreover they don't spend an abnormal amount of time basking on the pad, indicating that they get sufficient warmth from it (though the health and activity is a better indication). Another benefit from using the pad to heat the enclosure is that at 28 watts, it's very energy efficient and hence cost effective. Note: I keep my rooms very warm (in the low 70s). If you keep your rooms colder, you might need more than one pad to keep your enclosure in the correct temperature range.